The Concern Leadership Network (CLN) is a community of motivated leaders, advocates, and influencers who are bringing about positive and lasting change to families living in extreme poverty around the world. Our members are creative, caring, and inspiring individuals who help Concern increase awareness and raise funds. Today, meet CLN member Francesca Conlin. I am a junior copywriter at Birchbox, a monthly subscription service that delivers five personalized beauty samples right to your doorstep, tailored to your hair type, skin concerns, and more. My job is to help tell stories (because who doesn’t love a good one?) about the products we carry and why they might be great for you, making it easier to cut through the clutter and discover something new that you’ll love. Through my involvement with Concern, one of the biggest things I’ve come to value is the power of an education. It was something I had previously taken for granted, but it’s a privilege, not a right, in many parts of the world, which was affirmed by my field visit to Nairobi and Kisumu, Kenya with Concern in 2011. 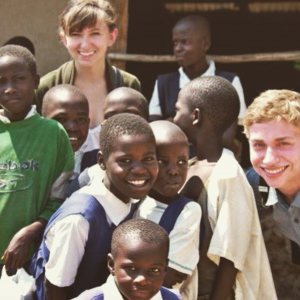 Francesca in Kenya with Concern and fellow CLN member Brett Hahn. On that visit, I met with a group of women who were part of a business cooperative Concern supports called the Yaw Pachi Support Group. Many of them were taking care of orphaned nieces and nephews whose parents had died from HIV/AIDS, in addition to their own children. Without the help from Concern to start their straw mat business, they would not have been able to provide all the children they look after with an education. That experience taught me how closely the cycle of poverty and education are linked. Those women received the business skills and education to start making mats and in turn could send their children to school — who might otherwise be collecting scrap metal to sell for money. I became involved with Concern roughly 10 years ago when I was in middle school. I won an iPod Shuffle (throwback) and wanted to raffle it off and donate the funds. 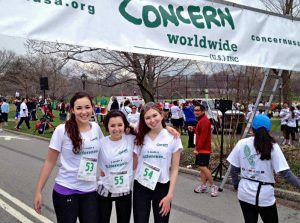 At the time I didn’t have a cause I was actively involved in, so a teacher of mine introduced me to Concern through Global Concerns Classroom (GCC) — now Concern Active Citizenship, which was a club specifically for high school classes. They let me in, though, and the rest is history! After I graduated from school (and GCC), I lost the structure of being able to engage with Concern on a weekly basis by attending a club meeting, plan educational assemblies, and other projects. So, when I heard that Concern was starting the CLN, I looked at it as a way to get hands-on experience as an adult with a group of people who share my love for Concern—almost like GCC for grownups! Unfortunately (although it would be great), we can’t all be on the front lines when a natural disaster hits in one of the countries that Concern supports, or even help out in a school opened and maintained by Concern. So, when if comes to international causes, most of us think we are limited to giving money. However, being a part of the CLN allows you to offer something that’s often way more valuable: your time. To bring more awareness to Concern, which sounds cliché, but many people don’t know the amazing things this organization is doing. When I explain that Concern reached millions of women and children just last year, how more than 90 cents of each dollar raised goes toward their life-saving work versus less than 10% that goes to overhead and operations, plus just how incredibly kind, sincere, and selfless the people who work for Concern are, it doesn’t take much convincing. If you’re reading this, then you probably already know all that, but I want the chance to tell more people and being involved with the CLN to plan events and initiatives in my office, my community, and amongst my peers grants that. At Birchbox, we’re so lucky to have what’s called the Do Good Division, which I’m incredibly happy to be a part of — thank you to the team for letting me join! Do Good (as we often refer to it) consists of a group of employees who are passionate about particular causes and plan bake-offs, product sales, volunteer days, and more to raise awareness and money for them. Most recently, with the help and generosity of Do Good, I raised money for the CLN Giving Tuesday Campaign and secured auction items for the Concern Winter Gala (which included a Birchbox subscription). Coming up, though, is the Concern Spring Run. Do Good has agreed to cover the registration fee of any Birchbox employee who wants to join and a plus one so they can also learn about Concern. In the spirit of a little friendly competition, we’re trying to gather a bigger team than The Churchill (which is the hard work of fellow CLN-er Sinéad Naughton, and conveniently located across the street from our office).